The fight between mobiles phones configuration and specification is a new concern in mobile technology. In various aspects of features mobile handset varies.The technology is increasing rapidly and making big differences to specifications and it becomes very tough task for buyers to choose specific mobile handsets with all the enhanced features and versions. Samsung announcedthe Samsung GALAXY S5 with adding all their new features to the mobile. Sony Xperia Z2 coming with new innovative design and features. LG G2 making it own mark to compete with Samsung Galaxy S5 and Sony Xperia Z2. All three supports high resolution displays of 1080p and the processor of snapdragon 800 family. Samsung Galaxy S5 and Sony Xperia Z2 both are water proof handsets and pretty close to over all configurations. LG G2 is much shorter in size which makes it compact. LG G2 features with image stabilization so it makes it unique from other two. From all three handsets only LG G2 doesn’t have micro SD slot for memory expansion. 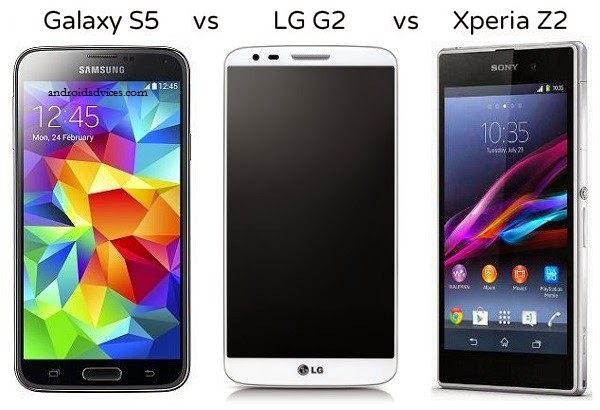 Here are some distinguish specification comparison among Samsung GALAXY S5 vs Sony Xperia Z2 vs LG G2 regarding design, display, camera, processor and RAM. Design: Samsung galaxy S5 having the dimension of 5.59*2.85*0.32 inches (142*72.5*8.1 mm) with weight of 145g while Sony Xperia Z2 comes with the dimension of 5.78*2.89*0.32inches (146.8*73.3*8.2 mm) and weight of 163g. LG G2 carries the weight of 143g and the dimensions 5.45*2.79*0.35 inches (138.5*70.9*8.9 mm). Display: Screen size of Samsung S5 is 5.1 inches and Sony Xperia Z2 and LG G2 both having 5.2 inches screen. All three of them come with the resolution of 1080*1920 pixels. Camera: Samsung Galaxy S5has 13 mega pixels rear camera with high resolution 4k video recording and 2.1 megapixel front camera. While Sony Z2 and LG G2 having 20.7 megapixel and 13 megapixel rear camera respectively. Powerful Processor and RAM: All phones having Quad core processor of snapdragon family chip set. The RAM of Sony Xperia Z2 is 3 GB and whiles others two phones having 2 GB RAM. Internal memory of Samsung S5 and LG G2 are of 32 GB and Sony Z2 appears with 16 GB internal memory. Given the specifications of Samsung GALAXY S5 vs Sony Xperia Z2 vs LG G2will help buyers choose the right handset according to their need and requirement.